Nein weder das Mondschaf noch Gasschiff – Flotten sind auf ihren Bildern auszumachen, dagegen viel flach gemachte Kubatur. Die dritte Dimension wird von den Farben weggeputzt: orange und türkis oder rot und grün oder coelin und kobaltblau, neapelgelb bis chromgelb manchmal violett behaupten die Felder – meist streng getrennt durch weiss, grau, schwarz oder der unbunten Metallfarben Gold, Silber, Kupfer, wobei Gold in einigen Werkgruppen den Goldhintergrund der Gotik und des Quattrocento als idealistischen, überirdischen Raum übernehmen: der Gedanke über der Beobachtung. Ansonsten scheint es bei den Metallfarben weniger um den Wert der Edelmetalle als vielmehr um deren Neutralisierungs- und Spiegelungs – Potenzial für die “farbigen” Farben zu gehen. Rita wehrt sich ernsthaft für die Farben und gegen die strikte Zuordnung ihrer Malerei zu Konstruktivismus und konkreter Kunst. 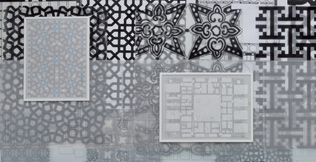 Die Überführung architektonischer Grundrissstrukturen und arabisch ornamentaler Keramik in geometrisch malerische Ausbalancierung ist ihr Anliegen – die Entgrenzung funktionaler Harmonien in funktionslos selbstgenügsame Bilder einer abstrakten Musik entsprechend. Nicht die Oper ist das Thema sondern die handlungslose Sonate, nicht die Überwältigung, sondern Verführung wird angestrebt. Rita Ernst wurde 1956 in Windisch geboren. Sie studierte an der Fachhochschule für Gestaltung in Basel. Ihre Werke wurden unter anderem im Haus Konstruktiv in Zürich, im Kunsthaus Zürich, und in diversen Institutionen im In- und Ausland ausgestellt. Rita Ernst erhielt zahlreiche Stipendien und Preise, 1991 Conrad-Ferdinand-Meyer-Preis, Zürich, 1996 Primo Premio Trevi Flash Museum, Italien, 2006 Preis der Fontana-Gränacher-Stiftung, Zürich, 2008 Artist in Residence, Bar Bach Hamba, Tunesien. 2010 Einzelausstellung im Mies van der Rohe Haus in Berlin. Zu dieser Ausstellung ist ein Katalog erschienen. Rita Ernst lebt in Zürich und Trapani, Sizilien. Rita is earnest about the appropriation of floor plans and ornaments, as well as their delimitation of more or less coloured structures. And climbs them thus, with his tube. No, neither the moon sheep nor gas-ship fleets can be seen in her paintings, but there is plenty of flattened cubature. The third dimension is wiped away by the colours: orange and turquoise, or red and green, or cerulean and cobalt blue, Naples yellow to chrome yellow and sometimes violet claim the fields – mostly separated strictly by white, grey, black or the achromatic metallic colours of gold, silver or copper, whereby in some groups of works, gold carries over the gold background of the Gothic or Quattrocento styles as an idealistic, supernatural space: the notion cultivates the observation. Otherwise, the metallic colours appear to be less about the value of precious metals, than about their potential for neutralising and reflecting the “colourful” colours. Rita puts up an earnest fight for colours and resists against the strict classification of her painting style as constructivism or concrete art. Her concern is the conversion of architectural floor plan structures and Arabian ornamental ceramics into geometrically pictorial balancing – the delimitation of functional harmonies, producing functionless self-sufficient paintings, analogous to abstract music. The theme is not the opera, but the non-narrative sonata; the goal is not to overwhelm, but to seduce. Some paintings could well pass as notations of contemporary music; their deconstructive painting style moves rhythmically. These rhythms often continue beyond the edges of the image. Their complex repetition and deviation are sometimes reminiscent of Islamic mosques, in which the static properties of the heavy columns appear to be nullified by the all-over ornamentation: the dancing, world-encompassing geometry extends out into the universe, whereupon Rita Ernst also applies aniconism, albeit without any transcendental claim. On the other hand, it is also true that instead of clarified, cool calculation, a playfully extrapolating geometrisation takes place. Only in the latest body of works, which address floor plans by Mies van der Rohe, are there no longer any primary colours – the grand master of modernist architecture seems to have driven them out of her, in favour of black and white, as well as differentiated tones of beige and grey, along with an aged golden ochre, which no longer promises another world. It appears to be no coincidence that she uses his works rather than the Concrete Baroque of, for instance, Le Corbusier, because despite all the romantic geometric invention, her agenda has a certain inherent strictness (at least as a starting point).